Malawi: "A house that’s complete"
Japan, spring 2016: "How to awaken in us the courage of mercy? " Hong Kong: Prayers and meetings to "uncover the wellspring of trust in God"
Philippines: Meeting in Manila: "Most simply I am grateful for life"
Moldova, February 2016: Come Back in the Spring! Norway, Spring 2013: "We are truly one in Christ"
Russia: Easter 2011: What did you experience in Moscow during the pilgrimage? Denmark: “The great day of prayer"
Every evening during the meeting, at the end of the prayer, Brother Alois will speak to the participants. The texts of these meditations will be published on this page. We have received such a generous welcome. I would like to thank the families, the parishes, the Church leaders, those in the administration of the city and the region who enabled our meeting to run so smoothly. Thank you for schools you have provided. It is a joy that the European meeting has brought together Christians of different denominations as well as people who do not share faith in Christ but who seek to be peacemakers. Christ gave his life to bring together all human beings into one great family. He calls his followers to be a sign of his peace in the world. It is in order to constitute such a sign that reconciliation between Christians is so urgent. One question that we Christians urgently want to find an answer to is this: how to show by our lives that unity is possible while respecting pluralism? There will always be differences between Christians. They will remain an invitation to frank dialogue; they can also be enriching. But has not the time come to give priority to the baptismal identity common to us all, which already unites us in Christ? Today should not the Christian Churches dare to come under one roof, even before an agreement is reached on all theological questions? These days, you, the various Churches of Prague, are welcoming us—Protestants, Catholics and Orthodox. I am particularly touched that we are living this sign of unity in the land of John Hus, whose violent death will be remembered next year. The responsibilities for that division of the Church in the fifteenth century are shared, but his personality, of such integrity, leads us all to repent and be reconciled. Christ gives unity when and as he wishes. But if we do not wait for it together, how can he give us this gift? It is when they were gathered under one roof, with Mary as well, that the apostles received the gift of the Holy Spirit. And the Holy Spirit always unites us in our diversity. In a local community, we can come under one roof, among neighbors and families, as in "grass-roots communities", to pray together, to assist one another, and to get to know each other better. Local communities of different confessions are already collaborating in the study of the Bible, in social and pastoral activity, in catechesis. This could be intensified. Each community should do with Christians of other denominations all that it is possible to do together, and do nothing without taking the others into account. We are together in this beautiful Cathedral. Could not, in many cities, the cathedral or the main church become a common house of prayer for all the Christians in the area? Theological dialogue must continue. Would it be possible to do this more and more in a context of common prayer and with the awareness that we are already together? By living and praying together, properly theological questions are dealt with in a different way. Perhaps one could say the same for ethical reflection. All believers have received a portion of the pastoral gift to care for one another. The Christian family which is the Church also needs ministries of unity, at all levels. A ministry of communion at the universal level is traditionally associated with the Bishop of Rome. Could he not be recognized as the servant who cares for the concord of his brothers and sisters in their great diversity? Would it not be possible for the Churches to imagine different ways to relate to this ministry? Should not those Churches which emphasize that unity in the faith and agreement on ministries are required to receive communion together give as much weight to the harmony of mutual love? Could not they offer a wider Eucharistic hospitality to those who express the desire for unity and believe in the real presence of Christ? The Eucharist is not only the summit of unity; it is also the road to unity. Let us agree to go forward on a road that we do not know in advance, rooting ourselves in these words of Isaiah: "I will lead the blind on paths they have never known." We place our trust in the Holy Spirit to guide us on paths still unknown. His inspiration prepares us to become authentic witnesses of communion. When you arrived in Prague, you received the “Proposals” for the coming year, centered on Jesus’ call to be the salt of the earth. He does not say “You must be,” but simply “You are the salt of the earth.” The salt is mixed with the earth of humanity. Christ sends us everywhere to bring the good news of God’s love. How wonderful! God does not diffuse his peace magically from above, but through our lives. He puts his trust in us. He invites us to be a leaven of peace in the dough of humanity, this humanity tragically torn apart by conflicts, whether armed or not. God awaits from us a yes to his love. A yes like the one Mary spoke, a courageous yes, expressing all our trust. In addition to her, countless other witnesses of God support us. Brother Roger is part of that cloud of witnesses. During the coming year we will remember him. 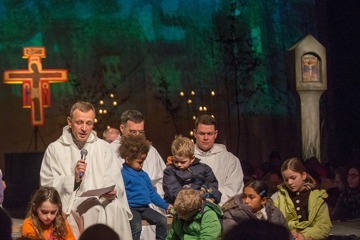 At Taizé, in addition to meetings every week there will be a meeting for young people living in community, and another one for young theologians. On the week of August 9 to 16 a “Gathering for a New Solidarity” will be held. Why “new solidarity”? New, because it is a matter of deciding anew to live in solidarity. Everyone can make friendship between human beings and between peoples a priority, and contribute to this through the gifts they have received. The effort, or even the sacrifices that this entails, give joy and meaning to life. New, too, because we are facing unknown challenges. How can we be part of globalization in a positive way, one that does not entail oppression of the poor or of minority cultures? How can we live in an increasingly technological world? Among the main issues too are undoubtedly migration and ecology. New, finally, because solidarity involves a change in our attitudes. Helping the very poor will always be necessary. But respect for the dignity of every human being leads us to abandon a paternalistic attitude in order to live in reciprocity. Those who are poorer than we are have much to give; they make us more human, sometimes they help us better to understand the Gospel in all its depth. In Taizé we do not have any ready-made solutions to these hard questions; our community wants rather to offer a platform for searching, for encounters between people and different initiatives. Mutual listening can cause projects to arise; it may lead some people to take far-reaching decisions for their future. Brother Roger sought to live a life of brotherhood, not to remain on a theoretical level. At 25 he began in Taizé all by himself, and then the first brothers came. They made a life-commitment together. Brother Roger never could have imagined what would grow from this small seed. His life encourages us to begin with almost nothing. All of us, in the places where we live, want to be pilgrims of trust. The trusting of faith is in fact what animates our lives each day. Large celebrations, like our meeting in Prague, are not an end in themselves but support us on our journey forward. For the future, then, we are preparing other stages of the pilgrimage of trust. After the youth of America, Asia and Africa, young people of Oceania want to be a part of our pilgrimage. The next steps will take place already very soon, in February, in Australia and New Zealand. A year and a half from now, in 2016, we will return to the continent so close to Europe and yet so little understood, to Africa. After the meetings in Kenya and then in Rwanda, young people from West Africa will come together and also invite people from other continents to this stage of the pilgrimage of trust. We will be welcomed in early September 2016 in Benin, at Cotonou. And in a year, at the end of 2015, there will be the next European meeting. We will go to a Southern country well known for its warm hospitality, but one which is undergoing economic difficulties. From December 28 to January 1 we are invited to Spain, to the city of Valencia. To conclude, I will say a few words to the Spanish people here.To the young people of Spain I want to say: you are spiritual sons and daughters of Saint Teresa of Avila, whose 500th anniversary is being celebrated, and also of John of the Cross. In their day they reawakened a mystical life in Spain. Your generation is called in its turn to light the fire of a renewed faith in your country. We will go to Valencia to be touched by that fire, so that it can burn across Europe. Having come from all the countries of Europe, and also from other continents, we are letting ourselves be inspired these days by the words of Christ: “You are the salt of the earth.” And we are looking in particular at how these words encourage us to be creators of peace on earth. What joy to see our lives in this light! Our European meeting can make us more aware of the universal communion that Christ wants to create between human beings. Scattered throughout the earth, we can then help allow the peace of God to shine out in humanity. Here in the Czech Republic, we are receiving a wonderful welcome. Certainly, the Christians are a minority. But there is also in this country a noble humanist tradition, nourished by art, literature, painting and music. In this way believers and non-believers together support a tendency that can resist the bland materialism which threatens our societies. Christians are a minority here as they are in many parts of the world, and as the early Christians were. They are salt of the earth not by seeking power, not by imposing their views on society, but by being simple peacemakers and working for justice in the places where they live. I would like to say to the Czech Christians: you really are salt of the earth. This is as true today as it was in the past. Our Taizé Community keeps alive the memory of so many witnesses to the faith in your country who fought for freedom and who were willing to pay the price with their lives. I think especially of Maria and Jiří Kaplan, who have already joined Christ in the life of eternity. You young Europeans, do you know that Cardinal Duka who, as Archbishop of Prague, together with the leaders of other Churches has been so supportive of the preparation of this meeting, do you know that he spent time in prison because of his faith? I also want to mention Pastor Alfréd Kocáb, the first Czech who came to Taizé with his wife Darja in 1967. For many years he was forbidden to exercise his ministry; he worked stoking the heating in a museum. In the cellar, beside the coal, he met with theology students in secret and taught courses, including one on St. John of the Cross. He is now ill and could not come to be with us, but we greet him through television. To all the young people taking part in this European meeting, various concrete proposals have been made for the coming year. One of these proposals is to spend half an hour in silence every Sunday night, with others, for world peace. This is half an hour devoted first of all to entrusting to God countries and people suffering from violence. It is also a time to welcome the peace of Christ into ourselves to prepare us to be, in the places where we live, peacemakers and creators of justice. Last year our pilgrimage of trust took us to several countries of America, including Cuba. Many young Cubans told us that they felt too isolated. They asked me to greet the young people in Prague. So, you are warmly greeted by the young people of Cuba! These young people have written short prayers of intercession they wanted to entrust to you. At the end of this prayer you will receive a small paper with one of these intercessions. Your prayer will support the youth of Cuba. And finally, some news. Among us there are young people from Russia, from Belarus and from Ukraine, belonging to different churches. With them we know that Christ is our hope, our peace. So, with a few of my brothers and with young people from different countries of Europe, we will go on pilgrimage to celebrate the resurrection of Christ together with them in their countries during the Orthodox feast of Easter next April 12. One hundred young people from other countries can take part in this pilgrimage in Russia and in Ukraine. Those of you who would like to come with us either to spend five days in Moscow or five days in Kiev and Lviv will find information on the sheet you have received and can come and talk about this tomorrow at 5pm in Hall 6. Tomorrow morning, in groups, you will reflect on these words of Christ "Blessed are the peacemakers" and you will think about what concrete steps to undertake both near and far away in order to create peace. It is a great joy to be here together in the Czech Republic, at the center of Europe. Already on this first day, we want to thank all those who have prepared such a generous welcome. We already held a European meeting here in 1990, a year after the unforgettable “velvet revolution,” that moment of freedom when borders fell. At Taizé, and I think that we are far from alone in this, we remain grateful to the people of Central and Eastern Europe for having shown that the unexpected was possible. The memory of this great liberation offers hope that even today, at this moment of tension in the world, a peaceful future is possible. Our meeting clearly shows that among every people there are women and men who want peace. These days we will pray for those suffering from violence and war—in Ukraine, the Middle East and elsewhere. The Lebanese who are here with us bear within themselves the trials of their region. Their country hosts thousands of refugees from Iraq and Syria. I would like to tell them: remember that all of us are close to you in prayer and in our hearts. This is still so true today! To live in peace and to contribute to world peace, Europe must of course be built up by closer economic and political relations. But the motivation must spring from a deeper source. For us, this source is in the peace that Christ communicates to us. We want to be a leaven of peace in humanity. For this it is indispensable to welcome the peace of God in our hearts. In the coming months, we shall be guided by the Gospel words: “You are the salt of the earth.” Christ warns us: make sure that the salt does not lose its flavor! We must not give in to discouragement and pessimism. But how can we welcome the peace of Christ that God wants to give us? We cannot always feel the presence of God. A believer can also experience the night of faith. Our trust in God can be combined with doubt in the face of a mystery that is so far beyond us. Does not welcoming the peace of Christ mean having simple trust in a presence? A child can show this trust naturally. We adults have to choose it. This choice is made with all our being, with the mind and the emotions. Our trust remains fragile throughout our life; it grows when we share it with others. Then there can be moments of light, of clarity, of joy. We understand that this is the presence of the Holy Spirit, the Spirit of the Risen Christ, who dwells in our hearts. These days we will renew our faith in the Holy Spirit, who communicates the peace of Christ. We cannot keep this peace for ourselves alone; it becomes kindness towards others, refusal of injustices, and commitment with all our strength to make the earth a place fit to live in for all. There are a great many ways to reach the source of Christ’s peace. There is prayer, even when it is poor. There is also beauty, that of nature, that which art reveals to us. Peter writes: Christ was put to death in the body and raised to life in the Spirit. And in the Spirit he also went to announce the Gospel to those who once had refused to believe.